"According to interviews with Afghan and Western officials, as well as smugglers and community members, dozens of senior Taliban leaders have become so enmeshed in the drug trade that it has become difficult to distinguish their group from a dedicated drug cartel. While the Taliban have long profited from the taxation and protection of the drug trade in Afghanistan, insurgents are now taking more direct roles and claiming spots higher up in the opium chain. 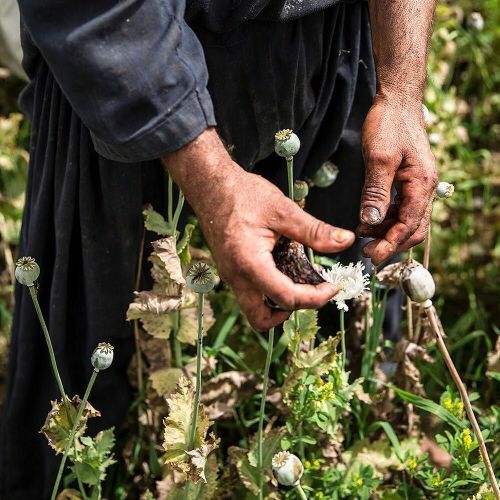 In some areas of Afghanistan, the Taliban have even provided seeds for farmers to grow opium on the insurgents' behalf, or paid middlemen to purchase opium for them to store while they wait for prices to increase. @bdentonphoto took this photograph of farmers harvesting opium from the bulbs of poppies while on #nytassignment in Afghanistan's Helmand Province." By nytimes on Instagram.